Turmeric is a popular spice in many ethnic cuisines, and is also used as an additive in numerous condiments and prepared foods. It is a relative of ginger. This bright yellow spice is made by collecting the rhizomes and roots from the turmeric plant, boiling and drying them, then grinding the dried parts into a powder. It can sometimes be found fresh in stores, but the prepared variety is more commonly used in cooking. Known as “haldi” in India, turmeric has been in use for more than 4000, years and is found in virtually all Indian recipes. 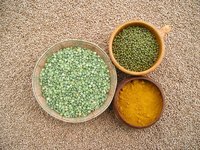 It is a basic component of curry powder, giving the powder its bright yellow color, and is found in curries, as well as other meat and vegetable dishes, such as dal, a red-lentil curry, and mulligatawny soup. The Chinese call turmeric “jiang huang,” and it is a fundamental treatment in Chinese medicine, as well as an essential spice in Chinese cuisine. Turmeric is also used liberally in Indonesian and Thai cuisines, often combined with coconut milk in fish and other curries, and is a fundamental spice in the cuisine of Morocco, where it is used in meat, vegetable and couscous dishes. Turmeric is also a popular food additive, primarily for the yellow color it imparts to food. The bright yellow of mustard comes from turmeric, and the spice is also often added to dried, packaged soups to give them a heartier appearance. A combination of turmeric and annatto is frequently used to color dairy products such as butter, cheese and yogurt. While fresh turmeric has a spicy taste similar to that of ginger, ground turmeric is milder, with a slightly woody, herbaceous taste. If you wish to add turmeric to your cooking repertoire, it works nicely with vegetables, meats and fish. Heat a bit of oil, then add 1/2 tsp. or so of turmeric. Stir until the mixture is fragrant, then add cauliflower or your choice of vegetable, meat or fish and sauté. Make a simple dal, an Indian vegetable dish, by simmering red lentils in a broth of water and turmeric and add some aromatics such as cumin, chopped onions and garlic. Serve once the mixture has thickened. If a recipe calls for saffron for its yellow color, turmeric is a much less expensive substitute. Fresh or powdered, turmeric adds bright color and flavor to dishes as varied as scrambled tofu, cucumber pickles and Indian curry.